Senator Al Franken; Is That The Sound Of Bill O’Reilly’s Head Exploding? I’ve always liked Al Franken, No matter what Fox Network (they’re not news) says about him, he’s funny and smart. More so than any of the Fox-licans that hate him. I used to listen to his Air America radio show because it was informative and funny. I quit listening in it’s last year because he started running for the US Senate and the funny suffered. I can get informative from anywhere. Here are a couple of cool videos taken recently at the Minnesota State Fair, of Senator Al Franken. 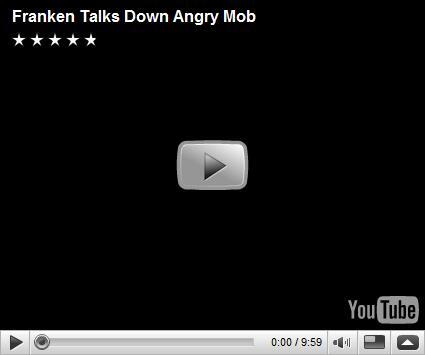 The first one, he talks down a Tea Bagger mob with logic, reason, and knowledge. The second he draws a USA map from memory. I’d like to see Bill O’Reilly do either. Glenn Beck is so unhinged. Crying one minute and then screaming like a banshee the next. Here’s a mashup song/video of "some" of his most outrageous moments, put to music. Why does WLW-700 hate me? I remember on Sept 11, 2001, I was working all day in Cincinnati, Ohio. I lived in Toledo at the time, but I still loved to listen any time I could to WLW, which I could get most of the time even in Michigan. I was glued to WLW all day that day as was usual for me anyway. On Sept. 11, we were all patriots and had a common cause. Comedian Gary Burbank was the main reason I listened, and I even had a lot of respect for host Mike McConnell. I loved the Reds and had been listening to them on 700 since the late sixties. I grew up listening to Ruth Lyons 50-50 Club with my mother every afternoon. The Official Cable Guy of The Stephanie Miller Show!!! I asked. But I had to work for it. For a couple of years now, I have been subscribing to the podcast of The Stephanie Miller Show and listening to it on my iPod almost every week day. It is a popular political comedy radio show that is carried locally on WVKO 1580AM (Columbus), nationally on other syndicated radio stations, a live Internet stream, an iTunes podcast, and is carried live on Sirius Satellite. A couple of weeks ago, Stephanie mentioned on the show that she wanted listeners to send in a new version of their comedy song, You’re a Lying Sack of Crap. The original song is very well done and there is a version by a cute little girl named Audrey that they play. They usually play the song when they have an audio clip of or talk about a politician or other celebrity that is obviously lying about something. I gave it a little thought. Although I thought it would be cool to submit one, I didn’t think I would. Every other time except once when I have contacted them, they have ignored me or not been entirely friendly. The producer, Chris Lavoie answered me once about a podcast issue and was very nice. I e-mailed Rebecca Baker, the assistant producer, once about a similar issue and her reply felt like a “go jump in the lake” kind of an answer. I know the more successful they get, the harder it is to please everyone. There were few ways for me to impress them enough to get their attention with so many other witty people calling and writing in. I understand. Where is the Fairness Doctrine When You Need It? The Fairness Doctrine, was eliminated in 1988 by the hired guns of the broadcast industry with the help of the Industrial War Complex(aka The Reagan/Bush administration). It was known as the Equal Time rule in broadcasting. I heard someone mention the fairness doctrine on the radio recently, implying that the loss of the doctrine was directly responsible for the creation of the FOX (Propaganda) News Network on cable. I have been in cable television and broadcasting, building and operating wireless, copper and fiber networks for almost thirty years. I know a little about the Fairness Doctrine. During the time that I have been traveling to Columbus to work, you would think that I would have had plenty of time to think about things and come up with some new plans for fun and exciting things to do. The truth is that I have not done that. Most of the time I have been just listening to the CD player and National Public Radio (NPR). When I am in the Toledo area, I listen to the Detroit NPR station as the Toledo station is usually playing classical music most of the day. When I get close to Columbus I can begin to pick up the Columbus NPR station on AM. I enjoy listening to NPR and don’t feel guilty about not paying for it other than the money they receive from me through my taxes. Maybe I’ll donate more someday, maybe not.